Super long days with most of the time spent travelling in the tour bus, lack of flexibility to explore the city on our own, changing hotels everyday – these are reasons why we don’t take up typical tour packages and instead plan our own trips. The prices for such tour packages are however much affordable compared to travelling on our own if you factor in the airfare and accommodation – I guess that’s because the tour agencies have bulk discount rates with the airlines and hotels. Thus, I was pleasantly surprised with MISA Travel’s brand new Group “GO” Flexi packages which gives you the best of both worlds – ample free time and flexibility to explore the destination on your own and yet enjoy value for money rates for airfares and room. You will still be travelling in a group but will be given time to explore the city before reconvening with the group to continue the tour. There are great deals in the Taiwan Group “GO” Flexi and each tour participant is given a choice of either a farm stay or free & easy shopping in Taipei or theme park fun for 1-2 days of the tour. This is almost unheard of in any other tour packages where there will at most be 5-6 hours given to the tour group for free & easy time at a city before being herded back to the bus to rush to the next city. With MISA Travel’s Group “GO” Flexi, you get to do your favourite activities for a few days before joining the group to do the usual touristy stuff and still enjoy affordable prices for the entire tour package. 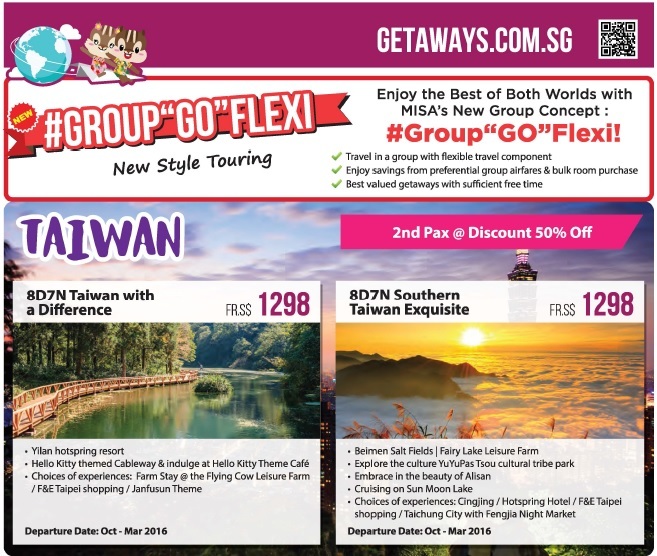 And with the Travel Revolution Fair 2015, MISA Travel is giving an additional 50% off for the 2nd traveller for these Taiwan Group “GO” Flexi tour packages! 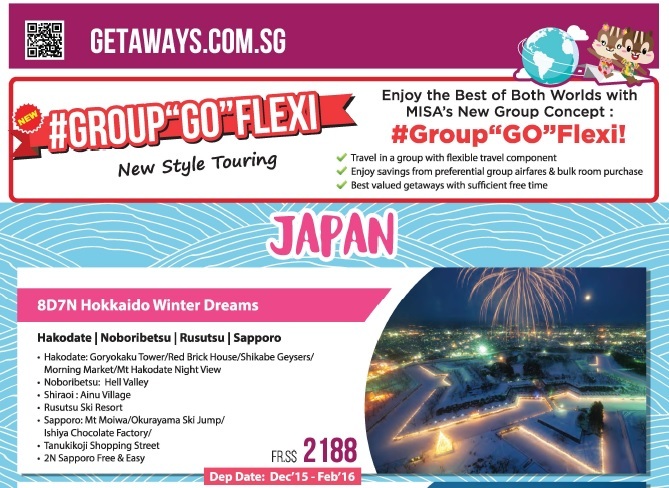 Another example of MISA TRAVEL Group “GO” Flexi package for travelling to Japan. 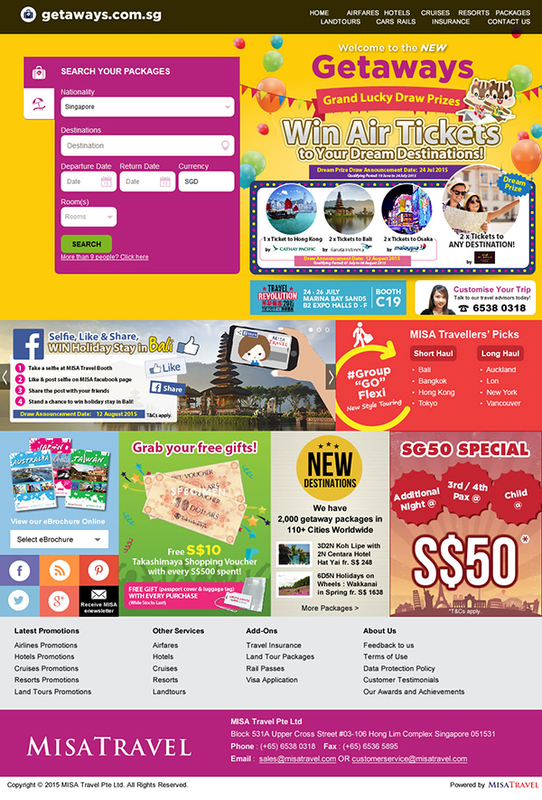 For more info on the Group “GO” Flexi, check out MISA Travel’s revamped www.getaways.com.sg website! There are MISA Travellers’ picks for short haul Group “GO” Flexi trips to Bali, Bangkok, Hong Kong as well as long haul ones to New York, London, Auckland! Even for Free & Independent Travellers (FIT) like us, Getaways.com.sg also has a lot to offer e.g. affordable packages for self-drives, theme park visits, mini stays, etc. They have just revamped their website so it is easier to navigate and pick up the best deals for your next trip! If you are planning for your next holiday for one of the remaining 4 long weekend Singapore holidays, then you should check out the Travel Revolution Fair 2015 held at Marina Bay Sands B2 Expo Halls D – F (Booth C19) from 24 to 26 July 2015 to pick up the best travel promotions and deals. MISA Travel is also exhibiting at this travel fair and they are offering a lot of great deals and promotions. MISA Travel’s SG50 promotion is super attractive – you will pay just $50 for either an additional night or for the 3rd/4th pax or for a child to travel. Do note that terms and conditions apply so do check in with the MISA Travel for more details. While you are at the MISA Travel Booth C19 at the Travel Revolution Fair 2015 at Marina Bay Sands, why not spend a few minutes to take a selfie at their booth and then like and post the selfie on MISA facebook page. Then share the post with your friends and you could be on your way to a holiday stay in Bali! The draw announcement date is on 12 August 2015 so don’t miss out this lucky draw to win a Bali holiday. Terms and conditions apply so check in with the MISA Travel folks while you are at their booth. Also look out for MISA’s new loyalty program called MISA Travel Lounge. Every booking and activity with MISA Travel will earn the Lounger (this is what MISA Travel call the members) points, which can be used for booking discounts. I don’t think there are such loyalty programmes with other travel agencies so this is quite an innovation and benefits travellers too with opportunities for more discounts for their trips! 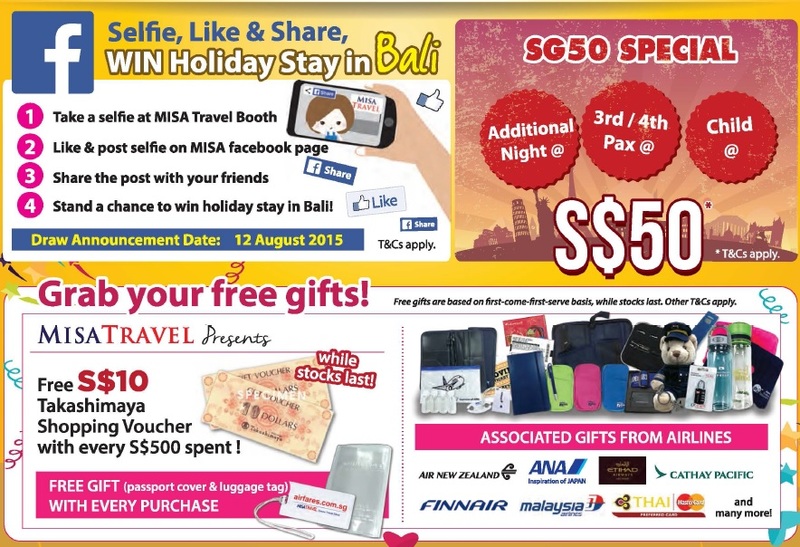 Even if you miss the Travel Revolution Fair at Marina Bay Sands this weekend, don’t worry as you can still enjoy the same deals and promotions as above (except the selfie at booth lucky draw) at MISA Travel’s in-house online fair until 31st July 2015. Just proceed to any of their websites e.g. www.airfares.com.sg, www.getaways.com.sg, www.hotels.com.sg, www.cruises.com.sg for the best deals. 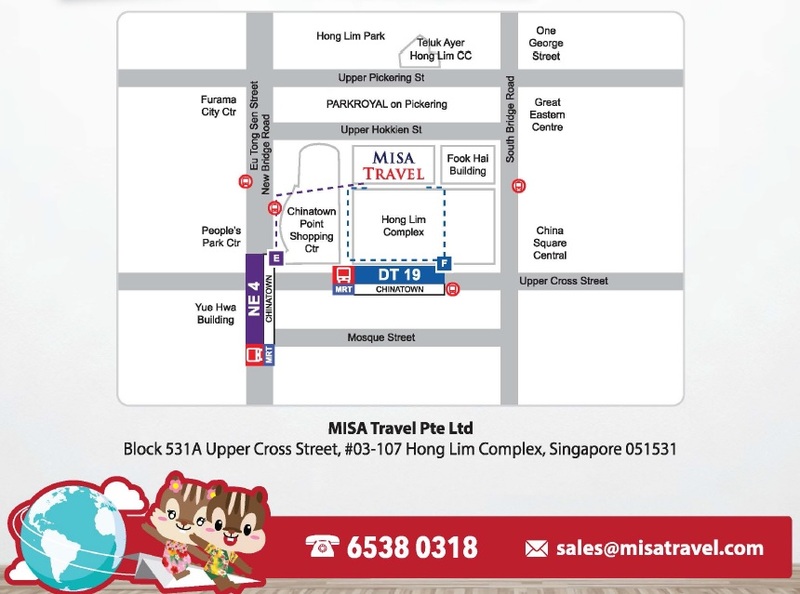 If you prefer to talk to someone at MISA Travel face to face to arrange your travel packages, MISA Travel is located at Hong Lim Complex in Chinatown (just a few minutes’ walk from Chinatown MRT station).